The Power that Preserves Stephen Donaldson Sci Fi. Book is in good condition, all pages intact. For the third time, Thomas Covenant is drawn into the magical world of the Land to defeat the armies of Lord Foul. Armed with the power of White Gold, Thomas leads a giant, a bloodguard, and an old rival of his to face Lord Foul once again. 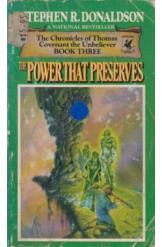 Book 3 of the Chronicles of Thomas Covenant the Unbeliever.